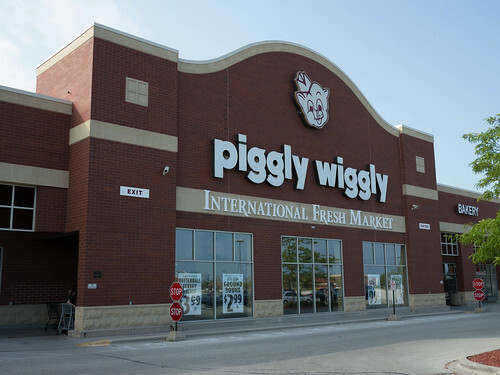 Piggly Wiggly is a chain grocery store that continues today in the Midwest and South. It started in Tennessee and expanded through regional franchise licenses across the entire country during and after World War One. Piggly Wiggly is popularly remembered as the first American self-service chain grocery, starting in 1916. Okay transplants, join us now and let’s get started. What was a self-service chain grocery store? Well, to you it’s just a grocery store. Piggly Wiggly was significant because: (a) chain groceries were scarce, and moreover (b) groceries were full-service. Imagine if grocery stores in Oregon were like gas stations: you walk in the door, say what you want, and someone brings it to you wrapped in paper. (Wealthy folk are you following along? If you have a personal buyer, or if you order exclusively for delivery by Amazon Fresh… You’re doing it pretty much exactly how the wealthy purchased groceries a hundred years ago. But they used a phone with wires.) Self-service chains attacked the low end of the market. And the low end grew tremendously due to rising food prices as war spread across Europe. If you Google “Piggly Wiggly 1916” you’ll find that all of humanity believes Piggly Wiggly invented the idea of self-service chain grocery stores. It’s not true. It’s false. False is when things are not true. Fabricated, wrong, deceptive, a lie. 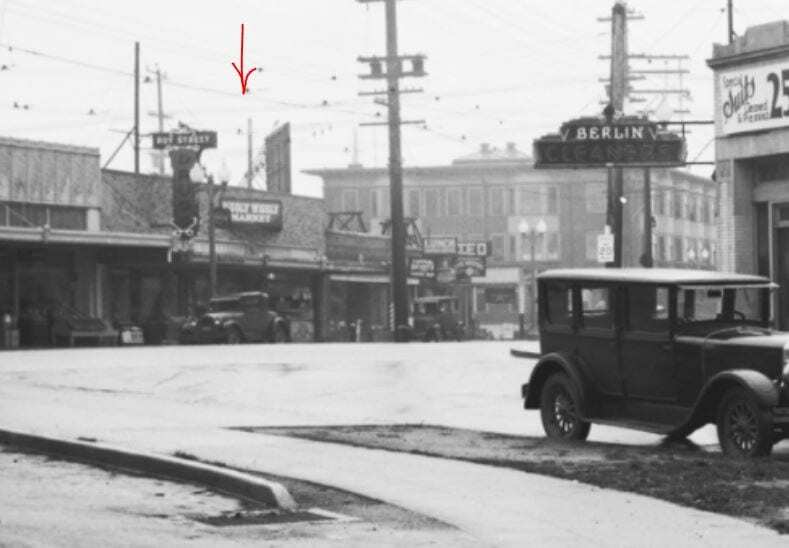 Zoom of Seattle Municipal Archives 50003, showing location of Piggly Wiggly in 1932 at 614 Broadway E, just south of Orpheum Records. Oh damn that is long gone isn’t it? Anyways, looking south from Roy Street Coffee. Piggly Wiggly’s added touch was the franchise model. Instead of reinventing the wheel, distributors and grocers around the country just bought the regional rights to Piggly Wiggly’s retail and distribution business model, and got access to their bulk-bought brands. By the time Piggly Wiggly arrived in Seattle, Groceteria had been in business for six years and had 30-odd stores mostly in the city and also out around Puget Sound. But Groceteria had plateaued after just a few years. The corporation was crippled when Alvin was drafted in World War One. He returned in 1919 a broken man, and his brothers were left to continue the business as best they could while he caused a series of distractions. Piggly Wiggly opened in Seattle as a direct attack on Groceteria. Several leaders of the local franchise had worked closely with the Monson brothers and learned from them as they created an entirely new sort of enterprise in 1915. Almost all of Piggly Wiggly’s rapidly opened stores were within spitting distance of Groceteria. Speaking in 2015 terms, the first Piggly Wiggly stores in order were at the unclothed-women-seller Showgirls on 1st, at barely-clothed-men-seller Abercrombie & Fitch on 4th, wine-cellar Bin 41 at the West Seattle Junction, mithril-seller Lothlorien Apartments on University Way, and finally store number five at Orpheum Records — I mean Poppy at Broadway and Roy. Piggly Wiggly Store Number Five moved around the bend in August 1927 to a brand new building, now the bank next to Poppy. At around the same time, Groceteria filed for bankruptcy. 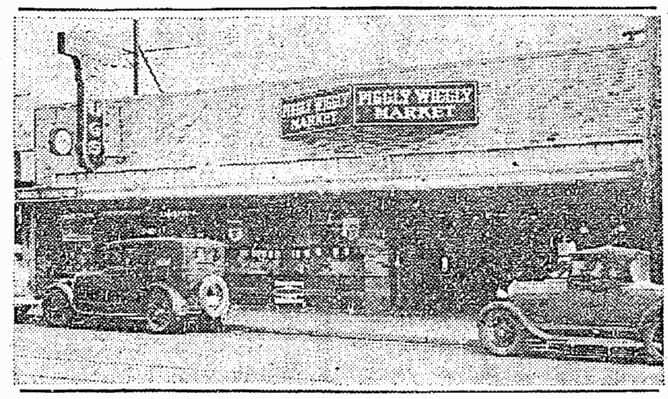 The Monsons were defeated by Piggly Wiggly and Skaggs United (1924 Seattle entrance), and their departure opened the floodgates to new chains in Seattle with new competition for Piggly Wiggly. In 1929, just before the stock market crashed, Piggly Wiggly Puget Sound merged with nine west coast chains that had recently merged to become MacMarr Stores. The local Piggly Wiggly brand survived and expanded. In 1931 MacMarr merged with Safeway, becoming a 4,000-store chain. Piggly Wiggly, including the Broadway and Roy store, continued to operate in parallel to Safeway as they ran out the franchise license but the former Marr stores joined former Skaggs United as Safeways. Finally in 1936 all of the Piggly Wiggly stores were converted to Safeway, giving the chain 64 stores in Seattle alone. 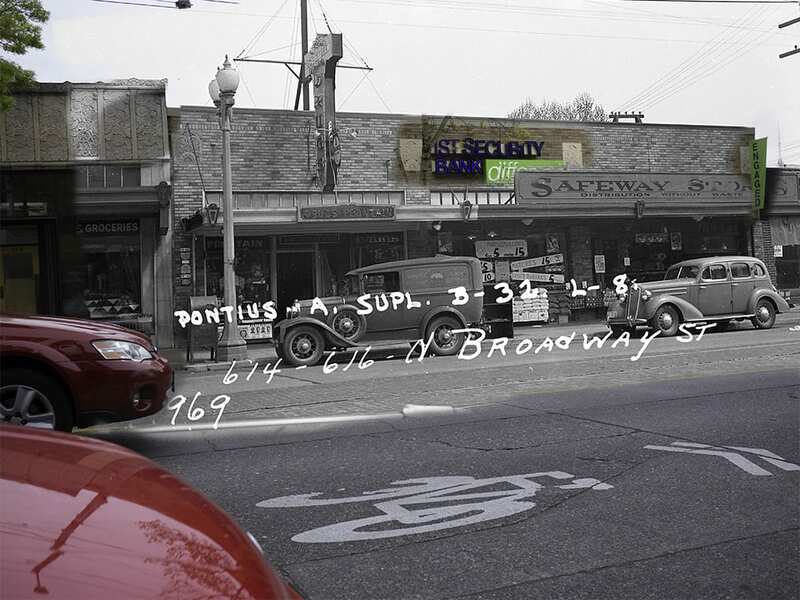 The Safeway on Broadway was closed by 1942, ending two decades of groceries at Roy. It wasn’t the last Broadway would see of Safeway, though. 1958 brought Safeway into v.3 of Broadway Market. And then in 1971 a number of small homes were bulldozed for the Safeway that preceded Brix. How long until Safeway, or the new Haggen-owned splinter of Safeway, opens again on Broadway? Two months back Re:Take focused on Broadway Market, where v3 brought Safeway back to Broadway in 1958. But does it fulfill Dotty Decoster’s rallying cry at the end of her 15th Ave Piggly Wiggly history that ran in CHS in 2009? “A history of Piggly Wiggly stores in the Northwest remains to be written.” Maybe I didn’t quite reach that bar, because I don’t know for sure if the 15th store was the last to open. I’m glad she read my romp through Piggly Wiggly history before she passed away, and this extension is dedicated to her. This entry was posted in News, etc. and tagged broadway, history, retake by Robert Ketcherside. Bookmark the permalink. I love these posts, especially the last two since I live just off Broadway in the area behind these buildings. Thank you, Mr. Ketcherside! I must admit, I admire someone ready to get arrested trying to save a building they don’t think should get torn down. Even if it’s a futile effort. These days people don’t seem to bat an eye, really. The 70’s were a very contentious time across the country, but especially in Seattle. Part of it was the Boeing Bust and labor struggles, but a large part of it was a group called the George Jackson Brigade, which had it out for Safeway and rich people. They bombed the Safeway distribution center in Bellevue, and the old Safeway store on 15th. 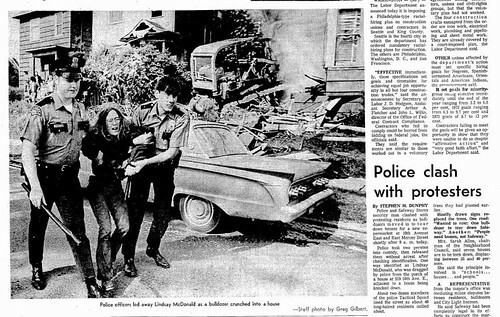 They also bombed the Laurelhurst substation on New Year’s Eve 1975. They were sort of based out of Capitol Hill, so I wonder if they were the ones involved in the protests.